Your opportunity for luxury North Vancouver home living is now available through the final release of spectacular Signature Estates at Raven Woods. There are 11 homes remaining and these duplex style townhomes are very spacious, ranging from 2287 sqft to over 3300 sqft, two or thre level North Vancouver homes for sale. In addition, double garages, premium appliances, generous patios and decks in addition to a great idyllic forested setting are all benefits of purchasing a North Vancouver Signature Estates at Raven Woods near Deep Cove. Life on the North Shore is now starting from the $800,000s. Visit 590 Raven Woods Drive to view the fully furnished Signature Estates at Raven Woods show home that is open on Wednesday, Saturday and Sunday from noon to five. At The Signature Estates in Raven Woods, North Vancouver real estate community, your backyard is the mountains; your front yard is the sea. Hit the slopes on Mount Seymour, stroll along the beach at Cates Park, or kayak with Takaya tours just minutes from your front door here at The Signature Estates in Raven Woods North Vancouver real estate development. The Signature Estates offer duplex style North Shore townhomes ranging in size from 2287 to over 3300 square feet. These spacious new North Vancouver homes for sale offer nine foot ceilings, generous decks and patios, double car garage and premium appliances including Sub-Zero refrigerator, a Bosch dishwasher, and a Bosch energy star washer and dryer. Your life on the North Shore starts here. Priced from $848,000. Visit the Signature Estates in Raven Woods North Vancouver fully furnished show home today at 590 Raven Woods Drive. They are open Monday, Wednesday, Saturday and Sunday from 12 to 4pm. www.RavenWoods.com or call 604.929.1915. For mobile updates on The Signature Estates in Raven Woods North Vancouver property development, just text “Signature” to 82442. Only 10 homes remain and they are priced from the mid-$800,000s. Such an elegant and masterful offering of signature townhomes,duplexes and single family detached homes, the Signature Estates at Raven Woods by Takaya Developments marketing brochure presents a once-in-a-lifetime real estate opportunity to be close to work, play and much more! Extraordinary in every respect, The Signature Estates at Raven Woods in North Vancouver, BC is an exclusive collection of townhomes, designed for those with exacting standards and impeccable taste. The lush North Shore setting of the Signature Estates at Raven Woods is matched only by the fine interiors, where every element has been carefully selected to create homes of rare distinction and quality. Where the outdoors is truly great. Vancouver’s North shore is world-renowned for its awe-inspiring landscape and outstanding recreation. Nestled at the base of Mount Seymour, the Signature Estates at Raven Woods is part of this exceptional environment. With three local mountains to choose from, some of the best skiing, snowboarding, mountain biking and hiking is just minutes from home. Surrounded by forests and streams, parks and trails, you can explore and enjoy this outdoor playground all year round at the Raven Woods Signature Estates townhome duplexes and single family homes. The grand opening of the show home for the luxurious North Vancouver Raven Woods Signature Estates homes is opening this weekend, September 19th and 20th from 12 noon to 5pm. This is the final release of homes for the Raven Woods Signature Estates, brought to you by Takaya Developments. With only 11 presale homes remaining, now is the time to purchase your home, your signature and your opportunity for luxury North Shore living. 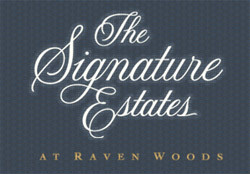 The Signature Estates North Vancouver homes is part of the Raven Woods community located in the Deep Cove Seymour area. Stunning from every angle these duplex style townhomes are spacious and well appointed. These three and four bedroom North Shore homes range in size from 2287 all to way to over 3300 square feet and they have nine foot ceilings, generous decks and patios, double car garage and premium appliances, including Wolf gas range top and built in convection oven, under counter wine storage, Sub-Zero fridge, a Bosch dishwasher and energy star washer and dryer. Life on the North Shore starting from just the $800,000s is now available at the North Vancouver Signature Estates at Raven Woods real estate development. Visit the fully furnished show home at the Signature Estates North Vancouver community starting this Saturday and Sunday, as well as Wednesdays starting next week from noon to 5pm. To schedule a private appointment outside of the regular hours, please call 604.649.5585 today for more details about remaining homes at the Raven Woods Signature Estates North Vancouver real estate development. Visit RavenWoods.com or call today for more details. For previous Ravenwoods Community apartment condo launches, please refer to Seasons West at Raven Woods and Deep Cove Seasons South at Ravenwoods in North Vancouver. An idyllic location with so much to offer. Walk or cycle to the sandy beaches and waterfront trails of Deep Cove. Enjoy golfing at two nearby golf courses or just practise your swing next door at the Takaya Golf Centre. Kayak the waters of Cates park at Takaya Tours, and then head to the legendary Raven Pub for après paddling refreshment. Whether outdoor activities or great community amenities, you’ll find it right here at the Signature Estates at Raven Woods in North Vancouver. From the boutiques and bistros of Deep Cove Village to the bustling market at Lonsdale Quay, this neighbourhood brims with local flavour and delightful diversions. Take in a show at Centennial Theatre or a photography exhibit at the Presentation House Gallery. Thrill your senses on the Capilano and Lynn Canyon Suspension Bridges or find calm as you stroll the Chiba Japanese Gardens. With so many choices at the Ravenwoods Signature Estates North Vancouver, every day can be a new adventure. Striking Westcoast style townhomes designed by Howard Bingham Hill Architects blend beautifully with the spectacular mountainside setting of the Raven Woods Signature Estates duplexes. With premium exterior finishes and accents of natural stone and cedar, this real estate collection is impeccably crafted and built to endure. By integrating unique details and design elements, each Signature Estates townhome at Ravenwoods is distinct, lending sophistication and rich architectural interest. Stunning from every ange. Inviting front walkways set with paving stones and elegant, gated entries add a sense of grandeur. Top-quality materials include rain-screen walls clad with James Hardie siding. Professional landscaping at the Signature estates at Raven Woods enhances privacy and contributes ot the attractive streetscape. Step into a home designed to delight your senses, warm up by the cozy natural gas fireplace. Soothe away tension in your own inset soaker tub with a mosaic glass tile surround, prepare a feast in your gourmet kitchen with all the extras, including a built-in wine refrigerator, premium stainless steel appliances, and hardwood cabinetry. Everywhere you turn, thoughtful details and fine materials create an experience of total luxury at the Signature Estates in North Vancouver’s Raven Woods real estate development. The Signature Estates at Raven Woods is built by Takaya Developments (2007) Ltd. in partnership with the Tsleil-Waututh Nation, Sligo Holdings (BC) Ltd., part of the Kuok Group, and NSI Strategic Investments Ltd. The Takaya Developments Group of Companies has built nearly 800 homes in the Raven Woods community over the past 15 years. Enjoy the Four Seasons in Your Exclusive Seaside Townhome. This is your last chance to own a Raven Woods Signature Estate Home at preconstruction prices! New presentation centre for Raven Woods North Vancouver master planned community grand opening is happening Saturday, June 7th. A great article by B. Kimmett for the Homebuyers Guide of Greater Vancouver: The sun glides gently over the idyllic oasis of mountain and forest, sitting on a scenic hilltop just off the Dollarton Highway, close to Deep Cove. Here the truly unique community of Raven Woods North Vancouver has been sensitively developed to take true advantage of this fantasic location overlooking the tranquility of the Burrard Inlet. The Signature Estates at Raven Woods is the newest phase of the master planned Raven Woods community in North Vancouver close to Deep Cove, and building on the success of the previous phases, a collection of 48 luxurious spacious townhomes will soon grace this spectacular setting. In designing these exlcusive pre-construction Signature Estates townhomes, Howard Bingham Hill Architects has created three and four bedroom townhomes ranging in size from 2,287 to over 3,000 square feet. Innovation is key here, with interiors that sparkle with unique distinction and ultra modern finishes. These Signature Estates at Raven Woods homes are what dreams are made of. Visualize generous decks and patios where you and your guests can savour the natural beauty surrounding you. Convenient double car garage provides convenience and security, and landscaped yards provide your own private oasis at these North Vancouver Raven Woods Signature Estates townhomes. You will be entranced by the subtle combination of rich exterior materials, that create a perfect blend between hardi-plank siding, stone accents and natural cedar detailing. Stress-reducing tranquility is a major feature at Raven Woods North Vancouver Signature Estates, with the lulling seaside atmosphere of the Burrard Inlet lapping in front of you, and the ever changing sky and forest shade. And when you enter your home you will experience the perfect fusion of convenience, peace of mind, all of the necessities and luxury. The Signature Estates at Raven Woods pre-construction North Vancouver townhomes has been created to ensure that the presales homes are safe, sound and energy efficient. In addition, the residenceds at the Signature Estates North Shore real estate are covered by the 2/5/10 warranty program from Travelers Guarantee Company of Canada. All pre-construction North Shore real estate homes at Raven Woods are also pre-wired for security systems, front entry video intercom system, and all of the bells and whistles for your technological needs. Empty nesters who want maintenance free living, but retaining single family home size interiors on the North Shore real estate love these spacious floor plans, and young professionals also are entranced by the size of these unique Raven Woods townhomes at the Signature Estate in North Vancouver. Interior colour schemes are coordinated by the award winning False Creek Design Group and complement the wide plank engineered hardwood floors, luxurious wool blend carpeting, and custom white oak or walnut stained rift-cut hardwood cabinetry in the kitchen which is the Lap of Luxury at the Signature Estates North Van. Gourmet kitchens will love the fully appointed professional kitchen which boasts such appliances as Sub-Zero stainless steel fridge, under counter wine storage fridge, 30 inch Wolf stainless steel four burner gas range, Bosch dishwasher and Bosch washer and dryer, to name a few of these luxury items that come standard in each and every one of these pre-construction North Shore townhomes at the Signature Estates at Raven Woods master planned community. From pampering ensuite spas with inviting inset soaker tub to the stunning natural setting, The Signature Estates at Raven Woods provides a lifestyle of luxurious living in a stunning natural environment. Whether sitting relaxing on your private deck or kayaking, sking or hiking just oustid eyour backyard, The Raven Woods Signature Estates townhomes pre-construction properties in the new North Vancouver real estate market is definiately “everything for everyone.” Let The Signature Estates at Raven Woods take your breath away by visiting the sales office. It is easy to find. From the Iron Workers Memorial Bridge, take the Dollarton Highway exit; continue east, turn left at Raven Woods Drive, and drive to the top of the road to the newly finished presentation centre. The office for the Signature Estates North Vancouver townhomes at Raven Woods community is open every day except Fridays between 12 pm and 5pm or by appointment. For more information about this pre-construction North Shore townhome development at Raven Woods, please call 604.929.1915 or visit www.ravenwoods.com. Raven Woods is well known for its thoughtfully designed and conceptualized floorplans and floorplates that provides ultimate living experiences. In the townhome series or Signature Estates at Raven Woods, there are three duplex townhome plans that include The Apex (A Floorplans) which is three floors and approximately 3,3337 square feet (total) with three bedrooms and den, 3 bathrooms and a bonus recreation room. The Burrard (B Plan) at Raven Woods Signature Estates is a 2 floor townhome duplex with approx 2,287 sq ft and 4 bedrooms and 4 bathrooms. The Capilano (or C Plan) at Signature Estates is a 2,491 square foot townhome with four beds and four baths as well. There will also be two single detached family homes for Floorplans D and F. The price range for the Signature Estates at Raven Woods ranges between $750,000 to $1M. UPDATE on The Signature Estates at Raven Woods Sales Office Now Open! If you have any question please call the sales office and speak to Terry Tornes or Bobby Seah at 604-929-1915 or send an email to sales@ravenwoods.com. Information is also available at www.ravenwoods.com. TAKAYA DEVELOPMENTS LTD.
Nestled at the base of Mount Seymour and just 20 minutes from downtown Vancouver, Signature Estates Raven Woods North Vancouver offers a limited collection of three and four bedroom townhomes and duplex homes ranging from 2,287 to more than 3,300 square feet. Sleek and sophisticated, these executive family residences at the Signature Estates North Vancouver Raven Woods real estate devleopment feature gourmet kitchens with Wolf and Sub-Zero stainless steel appliances, spacious patios and decks, double garages, and lushly landscaped yards. Open floor plans at the duplex and townhomes at Raven Woods’s Signature Estates North Vancouver homes provide easy living for today’s contemporary lifestyles. These luxury North Vancouver estate homes real estate are priced from $898,000 during this opening phase. The sales office is located at 501 – 560 Raven Woods Drive in North Vancouver and is now open Tuesday, Thursday and Sunday from noon – 5:00pm or by apointment anytime. For more information about the Ravenwoods Signature Estates in North Vancouver, plesae call 604.929.1915 or visit www.ravenwoods.com. North Shore Living is Now Within Reach at the Raven Woods Signature Estates North Van duplex homes for sale. Discover an exclusive collection of townhomes that brings together the best in quality and design at an incomparable price. Nestled at the base of Mt. Seymour in North Vancouver’s pristine area and just twenty minutes from downtown, these are absolutely exquisite residences for sale by Takaya Development. It’s the best of all worlds. A stellar location in the heart of White Rock that’s walking distance to the beach, shopping, and parks – some of these two and three bedroom homes even have water views toward the Pacific Ocean at the Pacific View at Five Corners. For families, you’re adjacent to an elementary school. Suites at the Pacific View Five Corners White Rock estate condo homes are large – ranging from 1,106 to over 1,600 square feet. But best of all, these 36 condominiums are GST exempt. And with a starting price of $349,900, that translates to getting an extra bonus on an already great value. The White Rock Pacific View condominiums at Five Corners will be ready for move in February 28th. For more info and to priority register, call 604.538, 0983 or visit www.pacificviewliving.ca. Pacific Views at Five Corners GRAND OPENING SALES EVENT THIS WEEKEND! Join us this Saturday for the grand opening of Pacific View. Sales begin when the doors open at NOON! Pacific View White Rock is a collection of 36 two and three bedroom homes designed with large spacious open layouts ranging from 1,120 to over 1,600 square feet. With two buildings to choose from and a variety of floor plans, Pacific View is your opportunity to purchase an affordable home within White Rock’s Premier Location - 5 Corners. 5 Corners provides the best of all local amenities right outside your door step! Now under construction, Park Place White Rock condos is a boutique collection of only 24 one and two bedroom condominiums, all with den. Sizes range from 800 to 1,079 square feet. There are six homes at White Rock Park Place condos on the main floor, each with a private patio. Above are two levels with seven homes each, and a fourth level featuring only four homes plus expansive rooftop patio with community garden, planter boxes and seating alcoves. Conveniently located a block from all the amenities of city centre and a flat, level walk to Semiahmoo Shopping Plaza. For more info about Park Place’s White Rock condos, visit www.parkplacewhiterock.com. Thank you for your interest in Park Place, featuring 24 boutique residences in the heart of White Rock! As we continue to put the finalizing touches on our Park Place White Rock Presentation Suite, I am excited to let you know that Jon and Todd are now making appointments for prospective buyers to view the Park Place Suite. As you already know, Park Place is ideally located within walking distance to a variety of shops and services off 18th Ave and 152nd street and minutes from the charming White Rock promenade. Plus, homeowners at Park Place can revel in the peace-of-mind knowing their home is backed by one of the most experienced builders in the country. Please don't delay in contacting me for an appointment since there are only 24 residences and some homes have already been sold. My direct line for scheduling is 778-836-8955 (or page our realtors Jon or Todd at Homelife Benchmark 604-531-1111). I look forward to hearing from you soon! Realtors are setting up their support to clothe and cover the homeless and help disadvantaged families in the Lower Mainland as the need increases both in and outside Vancouver’s larger urban communities. Members of the Real Estate Board of Greater Vancouver (REBGV), the Fraser Valley Real Estate Board (FVREB) and the Chilliwack and District Real Estate Board (CADREB) have joined in the 13h Annual Realtors Care Blanket Drive that runs form November 26 to December 3 across the entire Lower Mainland. Hanne Selby, past president of CADREB noted that the 2005 Homeless Count for Greater Vancouver showed that the number of homeless people in the South Fraser region alone grew by 133 per cent in three years. Last year, Realtors in Vancouver collected 3,365 bags of blankets, sleeping bags, tarps, winter coats, and warm clothing on behalf of over 30 local charities, ranging from Sea to Sky Community Services in Squamish to Mission Christmas Bureau and many in between. 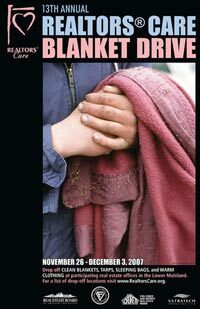 You can support the 13th Annual Realtors Care Blanket Drive. Drop off your clean blankets, winter and/or waterproof coats and warm clothing (in particular for men but also for women and children), at participating real estate offices. Donations are distributed locally and for free. For a list of drop-off locations throughout the Lower Mainland, visit www.realtorscare.org or call the Greater Vancouver, Fraser Valley and Chilliwack and District real estate boards. Introducing our custom home building division at the West Vancouver British Pacific Homes now available to meet your customized needs for building your dream home. British Paciific Homes real estate developer is the recently renamed home building division of British Pacific Properties, part of West Vancouver real estate since 1931. The division builds luxury custom homes for private clients on the North Shore and the West Side of Vancouver real estate market. If you are considering a custom home, we’d like to show you the advantages of dealing with a well-established, highly experienced West Vancouver builder of exclusive homes here at British Pacific Homes development team. For further information about services, timelines and quotes for a customized house by British Pacific Homes West Vancouver, please call 604.913.8318. Luxury view townhomes a first for British Properties. The Aerie British Pacific Properties, the original developer of West Vancouver’s signature residential area, is designing and building a collection of penthouse style townhomes. Published in Westcoast Homes & Design in Sept 2007. As West Vancouver’s British Properties residents are already aware, theirs is an ieghbourhood world-famous for its unique mountainside setting, spectacular ocean and city views and estate-quality homes. And now, for the first time in its 75-year history, the original developer, British Pacific Properties, is designing and building a groundbreaking collection of luxury penthouse-style townhomes. These will incorporate the same level of craftsmanship, amenities, fnishing, materials and designer fixtures as the company’s traditional homes. It will be called the British Properties Aerie townhomes. With only eight units in each of the two phases, each designed to capitalize on the breathtaking signature views that have made this the West Coast’s neighbourhood of choice since the 1930s, The Aerie British Properties guarantees privacy and exclusivity. And for those who are seeking a more carefree lifestyle but want the quality, craftsmanship and finishing that goes into British Properties’ traditional single-family estate homes, The Aerie could be what you’re looking for. In addition to private internal elevators (some plans) which connect each ground floor to a secured personal parking garage, Aerie homes have zone-controlled air conditioning, media room and huge landscaped terraces. The interiors feature exceptional quality in design and the detailing, extending from wood flooring and cabinets and stone and ceramic finishing to Sub-Zero refridgerators, Miele gas appliances, and Kohler, Blanco and Toto plumbing fixtures. With an eye to the future and the demand for sustainability, British Properties has also designed environmentally friendly green technology into the Aerie townhome residence project, including ground sourced energy system with individual zone control heating and cooling, rainwater recycling for landscape irrigation, low e-argon glass, low-flow plumbing fixtures for water conservation and eco-friendly (low VOC) paints, sealants and carpets. The beautiful architectural design for the Aerie British Properties residence townhomes was created by Creekside Architects and is ultimately view-driven. It is a blend of contemporary west-coast urbanism, set within the natural mountain landscape and features concrete construction, extensive glass and the generous use of heavy timber and locally quarried stone. Inside, open Aerie floor plans, floor-to-ceiling glass, warm neutral tones and the extensive use of natural materials create a sophisticated casual living environment appropriate to the spectacular natural setting. 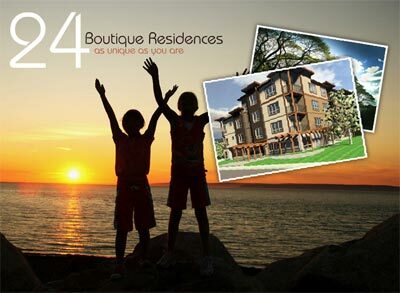 For more information about the British Properties Aerie townhomes, visit the website at www.britishproperties.com. Or you can call Shirley Clarke for a persona appointment of the Aerie residences at 604.925.8002 or 604.258.8808. The presentation centre for the British Properties townhomes at The Aerie are located at 2535 Garden Court (off Chairlift Road) in West Vancouver and is open Saturday and Sunday between 1 – 5pm. Over the last 75 years, British Pacific Properties has come to mean the finest views and the best neighbourhoods in all of Canada. With their latest creation, The Aerie British Pacific Properties has begun building a new generation of luxury town homes and penthouse style condominiums that are set to redefine life in West Vancouver. Comprised of two separate real estate developments, each phase limited to just eight residences, the Aerie features all the lavish design elements that are characteristics of the British Properties legacy. Located above Collingwood private prep school in prestigious Taylor’s Lookout neighbourhood, The Aerie will provide easy access to the area’s wealth of recreational amenities and nature oriented lifestyle. Hiking trails and favored mountain biking tracks are just around the corner, as is the highly antipicated “Mountain Path”, which will connect outlying neighbourhoods through a network of trails that can be used by cyclists and pedestrians alike. Deer and other wildlife are close by in the untouched parkland above 1200 feet. The homes at the British properties The Aerie presale condominium style penthouses and residences feature spacious outdoor living areas, some with fireplaces, allowing residents to take full advantage of the stunning panoramic views all year round. While the homes at The Aerie at British Properties are under construction there is the opportunity for some custom finishing, through time is of the essence. Each Aerie condo suite in the West Vancouver real estate market at the British Properties boasts zone-controlled air dconditioning, media rooms, and the latest in eco-friendly technology, such as a unique geothermal heating and cooling system, low VOC materials and rain water recycling for irrigation. This mix of luxury and ecology works to compliment the dramatic geography that surrounds The Aerie west Vancouver at the British Properties. Its proximity and easy access to Cypress Mountain for winter skiing an summer exploring makes for a unique residential setting that will allow residents to live comfortably within the serenity of nature. To learn more call Shirley Clarke at 604.925.8002 or visit www.britishproperties.com. The second phase of the West Vancouver Aerie Properties is now released. World class condominium residences at The Aerie West Vancouver real estate provides townhomes, terrace homes and penthouses starting from $2,198,000. The Discovery Centre for The West Vancouver Aerie British Properties is open between noon and 4pm on Saturday and Sunday at 2535 Garden Court Road (off Chairlift Road) and is now featured by Shirley Clarke real estate agent. For more information, you can click on www.britishproperties.com/the_aerie for details about The Aerie Residences. Experience the grandeur of The Aerie West Vancouver today. With breathtaking panoramic views, solid concrete construction, green building features, geothermal energy system for heating and cooling, extensive landscaping, town homes with beautiful garden patios, private elevators and much more, the custom finishing touches can be now yours if you contact the British Pacific Properties Aerie sales team for more information about these custom crafted West Vancouver homes at the British properties. For three quarters of a century, British Pacific Properties has come to signify the finest views and most privileged neighbourhoods in all of Canada. With their latest West Vancouver real estate development, The Aerie, Biritsh Pacific Properties have designed the next generation of penthouse-style condominiums that will capitalize on the finer points of life in West Vancouver. Lcoated within the highly prestigious Whitby Estates, The Aerie British Properties will provide easy access to the area’s abundance of recreational amenities, allowing residents to enjoy the nautral surroundings at ease. Hiking trails and prime biking tracks are just around the corner, as is the highly anticipated “Mountain Path” which will connect many of the outlying West Vancouver neighbourhoods through a network of trails that can be used by West Van pedestrians, and cyclists alike. “This is a new style of luxury mountainside living,” says British Pacific Properties President James Maclean. “We’re bringing all the crafitsmanship, amneities, designer fixtures and finishing materials that unerlie the quality of our Aerie single family homes and integrating them without compromise into these new Aerie condominium homes in West Vancouver real estate. The interiors of the homes exude the same comfortable, clean, and luxurious feel that British pacific Properties West Vancouver is famous for. The view driven architecture of The Aerie condo homes has been designed to compliment the spectacular vistas that surround the property. The homes include spacious outdoor living spaces, most with fireplaces, making it possible for esidents to enjoy the panoramic views in comfort all year long. Each British Pacific Properties Aerie West Vancouver condo residence boasts zone-controlled air conditioning, media rooms, and the latest in eco-friendly technology, such as a unique geothermal heating and cooling system, low VOC materials and rain water recycling for irrigation. Following the success of phase one Aerie Two West Vancouver condo homes is currently under construction and available for pre-construction West Vancouver condo purchase with homes starting at $2.198. To learn more, call Shirley Clarke’s real estate team at 604.925.8002 or visit www.britishproperties.com/the_aerie. Here are five reasons you’ll wish you lived here. BREATHTAKING VIEWS. Day or night, each British Properties West Vancouver home is blessed with unobstructed views of the Pacific Ocean, Vancouver’s glittering skyline and the tranquillity of the ancient rain forest. SUSTAINABLE ARCHITECTURE. Conscientious green features at the Aerie Residences in West Vancouver real estate features include geothermal energy system, rainwater harvested for irrigation, low e-argon glass and reinforced concrete construction. LUXURIOUS INTERIORS. Celebrating space and light, the Aerie British Properties residences in the West Van real estate market features low maintenance, spacious homes with exceptional natural materials, over height floor to ceiling windows, and generous patios and terraces. PRIME LOCATION. World renowned British Properties real estate developers, with unprecendented access Park Royal, Ambleside and Dundrave, while just 20 minutes away from downtown Vancouver. GREAT INVESTMENT. Built by the British Pacific Properties developers, a well trusted member of the West Vancouver real estate community since 1931 whose service and residential projects are renowned for their reliablility and excellence. Right now, the British Properties real estate offering in West Vancouver property market at The Aerie Residences includes: town homes, terrace homes, ane the Aerie Penthouses starting at $2,198,000. The Aerie Discovery Centre is open noon to 5pm except Frdiay at 2577 Chippendale Road in West Vancouver real estate. Contact Shirley Clarke at 604.258.8808 or Nikki Newson at 604.788.2630 for further information about the Aerie Residences in the British Properties. Visit www.aerieliving.com. For three quarters of a century, British Pacific Properties has come to signify the finest views and most privileged neighbourhoods in all of Canada. With their latest real estate development in West Vancouver, The Aerie, British Pacific Properties have designed the next generation of penthouse style condominiums that will capitalize on the finer points of life in West Van. Located within the highly prestigious Whitby Estates, The Aerie Residences in West Vancouver real estate will provide easy access to the area’s abundance of recreational amenities, allowing residents to enjoy the natural surroundings at ease. Hiking trails and prime biking tracks are just around the corner, as is the highly anticipated “Mountain Path,” which will connect many of the outlying neighbourhoods through a network of trails that can be used by pedestrian and cyclists alike. “This is a new style of luxury mountainside West Vancouver living,” says BPP President James. We’re brining all the craftsmanship, amenities, designer fixtures and finishing materials that underlie the quality of our single family homes and integrating them without compromise into these new Aerie condominium homes.” The interiors of the West Vancouver Aerie residences exude the same comfortable, celan and luxurious feel that British Pacific Properties is famous for. The view-driven architecture of The Aerie residences has been designed to compliment the spectacular vistas that surround the property. The new West Vancouver homes at The Aerie include spacious outdoor living spaces, most with fireplaces, making possible for residents to enjoy their panoramic views in comfort all year long. Each British Pacific Properties Aerie home boasts zone-controlled air conditioning, media rooms, and the latest in eco-friendly technology, such as a unique geothermal heating and cooling system, low VOC materials and rain water recycling for irrigation. Following the success of phase one, The Aerie West Vancouver homes phase two is currently under construction and available for pre-sale purchase with West Van homes starting at $2.198. A designer decorated Aerie penthouse suite and show home will be open for viewing in late October. To learn more, call Shirley Clarke at 604.258.8808 or Nikki at 604.788.2630 or visit www.aerieliving.com. An advertisement from Western Living. Situated on top of the South Facing slope of Hollyburn Mountain, The Properties West Vancouver real estate homes have incredible ocean and city views and are surrounded by West Vancouver’s natural beauty. Quality, location, private community and views are outstanding selling features for the new Properties West Vancouver residences. Right now, Karen of Sutton Group is selling 301-2255 Tiwn Creek, a 3130 sq ft, three bedroom The Properties by Quigg West Vancouver home for $3,188,000 and 102-2255 Twin Creek West Vancouver home for $1,888,000 which is a two bedroom plus office and 2,176 square feet in size. The Unit 101-2255 Twin Creek at the West Vancouver Properties Homes is a two bed plus office as well with 1,978 square footage and is listed at $1,688,000. The British Pacific Properties (BPP) report finds West Van real estate can support its aging population for only another two years when it comes to housing needs. A Staff Reporter, Daniel, for the North Shore Outlook. A British Pacific Properties report on West Vancouver’s demography and housing has found the municipality can only meet demand for the next two years. The report by Colliers International, and prepared for BPP, played a prominent role in the recently publicized Rodgers Creek West Vancouver real estate area development plan that calls for more than 700 housing units to be built above the Upper Level Highway in land primarily belonging to BPP. According to Andrew Pottinger, a spokesman for the real estate development company, the report on West Vancouver’s population and current housing is essential for the company to move forward with its building plans. Pottinger said the report is “hugely important for guiding the type of products we feel will meet those needs.” The BPP report argues that without new West Vancouver housing units, particularly apartments, “The housing supply in West Vancouver will not adequately accommodate the population as it ages.” It argues that without additional apartments for seniors to downsize to in the west Vancouver neighbourhood, current empty-nesters home owners in West Vancouver will not move and younger families will not be able to move into the area. The Aerie condominium homes in West Vancouver real estate market are built to LEED standards and includes such green building features (or BuiltGreen features) as geothermal energy heating and cooling, rain water harvesting for irrigation, low e-argon glass and low-flow plumbing fixtures, making it one of the most green condo buildings in West Vancouver’s property market ever. Interior design for these magnificent new West Van homes is Kari at Insight Design Group and the completed penthouse show suite is simply stunning. With an opulent kitchen to three inch thick granite counter tops and from natural wood flooring to beautiful millwork, these Aerie British Properties condominium residences in West Vancouver real estate market are to die for. Exquisitely finished and with wood fireplaces, natural stone work, hand laid tiles, oversized tubs with ocean views and custom cabinetry, you will not find a better finished new West Van condo home in the British Properties market. Some of the amenities and special features for pre-sale Aerie condominium home buyers include underground parking with individual garages for extra security and storage, open plan architecture and layouts, floor to ceiling windows throughout and panoramic views. These true contemporary West Coast West Vancouver Aerie British Properties homes have a beautiful architecture designed by Creekside Architects. British Pacific Properties has definitely lifted the concept of luxury apartments with space and privacy in The Aerie real estate development and with high-end finishes and design, the Aerie is simply a culmination of quality and craftsmanship at its finest. The British Properties Aerie penthouse suite is a 4500 square foot residence with spectacular ocean views now selling. The ultimate West Vancouver penthouse now open for viewing, featuring over four thousand five hundred square feet of ultra-luxurious single level living, with unobstructed panoramic views. This exceptional home is custom finished with exquisite natural materials, a personal elevator, state of the art fixtures and appliances, from your own private garage and terraceswith an outdoor natural gas fireplace. The British Properties Aerie penthouse suite is one of just eight exclusive residences in The Aerie and is built by British Pacific Properties. Priced at $4,950,000. Sensational concrete constructed 2938 square foot sub penthouse home designed and built by world renowned builder Quigg Group, perched up high in the prestigious West Vancouver Properies, offers spectacular full panoramic views of the city and ocean and is now being offered at $2,895,000 in the Whitby Estates West Vancouver real estate market. This stunning one level West Van sub-penthouse suite, with floor to ceiling windows, offers views from each and every room, and includes an elegant master suite, plus two bedrooms, four bathrooms, den, magnificent living room and dining area off an exceptional designer kitchen, with dry pantry and top of the line appliances. Other features of this Whitby Estates West Vancouver home for sale includes extensive use of granite, marble, limestone and hardwood, a private elevator, two car garage, many custom built features such as temperature controlled wine room and extensive built in cabinetry, plus spectacular large gardened terraces which is ideal for entertaining. Located at 2245 Twin Creek Place in the Whitby Estate West Vancouver real estate market, this stunning sub-penthouse is offered by Clarence at 604.726.5780.